GM is making it possible to shop right from your vehicle’s infotainment system, while on the go. The carmaker is pushing out an update for model year 2017 and later vehicles, which will go out to all cars even if the owner doesn’t have a paid in-car Wi-Fi data subscription, that adds ‘Marketplace,’ a new kind of commerce platform. 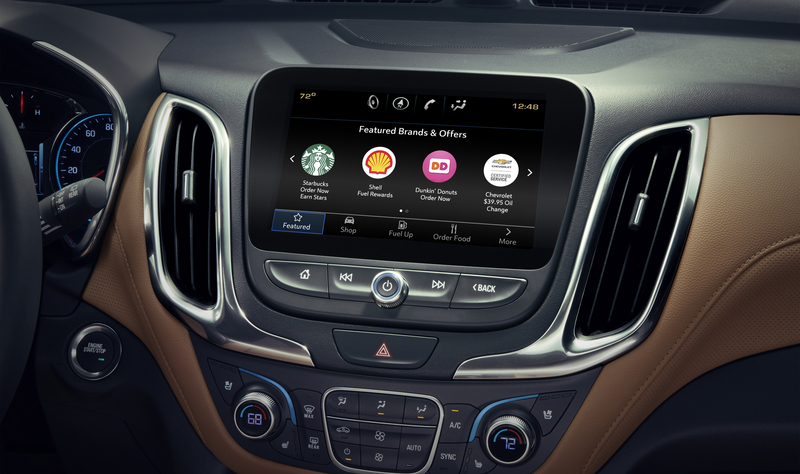 Marketplace is already rolling out to Chevrolet, Buick, GMC and Cadillac cars, and offers a number of possible purchase options through partners at launch, including Dunkin’ Donuts, Wingstop, Shell, ExxonMobil, Applebee’s and more. GM focused on retailers and gas station providers initially because these stand to have the most impact in terms of making car owner’s drive easier. You can also make reservations at restaurants via Marketplace (TGI Fridays is on board right now), as well as reserve parking spots ahead of time and then pay for time. And the in-dash Marketplace purchasing process is actually intended to be used while you’re actually driving, with a purchase flow that’s intended to minimize distraction and keep attention on the road. I spoke to GM Director of Global Digital Experience & Connected Vehicles John McFarland about why GM chose to build an in-vehicle ecommerce platform, and in particular one designed to actually be used while driving. “Rather than having somebody have to, if they’re going to engage on their phone, pull over and get in park while they’re doing it, which causes you to lose valuable time, or even worse, the temptation for people to try to use their phone while driving which is something that we definitely don’t want… we believe in doing everything we can to make it available while making it safe while in motion,” he said. Distracted driving is always top of mind for automakers, especially given the rising number of human-caused traffic fatalities. NHTSA has made clear how a significant portion of this is down to mobile device usage, which is a major contributor to distracted driving. GM has designed the ecommerce experience to be easy to navigate while on the road safety and securely, partly in hopes that people will take advantage of this rather than trying to accomplish the same thing using their smartphone. That also explains its choice of launch partners – McFarland made clear the carmaker wanted to select businesses that made sense for use on the road, with a focus on things that regularly make up part of a user’s commute. Starbucks is coming onboard in 2018, for instance, in addition to the other partners listed above. In addition to those, GM is also making it possible to buy upgrades, accessories and care for your GM vehicle, as well as top-ups for in-car Wi-Fi plans. Also, data used via Marketplace doesn’t count towards your totals if you are a Wi-Fi subscriber. One other way GM is making the in-car shopping experience more convenient is through user of machine learning to identify what you’re mostly likely to want to buy, and when. So, if you have a routine that typically involves picking up a coffee on the way to work, you’ll get a suggestion to pick one up based on signals including time of day, location, preferred merchant and more. As of right now, McFarland tells me that the Marketplace platform is considered ‘open,’ though GM is working directly with interested merchants, retailers and restaurants, along with its technology partners Xevo, Conversable and Sionic mobile to tailor their offerings before setting them live. This is another great example of an automaker varying their approach to business in order to become something more than just a seller of cars; we’ve seen a lot of carmakers engage in data plays, and in-car ecommerce is definitely part of that. It’s also a feature that could potentially have a tremendous impact in an autonomous driving future, and while McFarland says the focus thus far has been on building something that drivers can use while on the road now, they’ve definitely given thought to its potential in driverless applications.